Today is Tuesday March 29 2016. Sandy purchased a croissant and baguette for breakfast. After breakfast Sandy shopped at the Intra-Muros marche. “Our” vegetable / fruit seller was there and Sandy purchased strawberries, navel oranges, pears, carrots, cherry tomatoes, a sweet potato, and some tiny new golden potatoes. We walked to the bus stop at St. Vincent’s gate and took bus #1 to the Maupertuis stop. From here we walked 10 minutes (almost all up hill) to shop at the Secours Catholique (Catholic Relief) thrift shop. Sandy bought a night-gown, two pairs of socks and a washing mitt which is like a wash cloth for your hand to fit into. She watches the price signs on items as she shops to help her with French numbers. She thought she was spending around 3 – 4 euros. 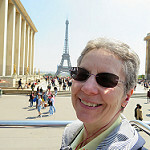 As she was checking out, the sales lady told her the price was “quatre-vingt-dix “. All Sandy heard was the “quatre” or four because the night-gown was at least one euro. She was mistaken as the price for all four items was 90 (quatre-vingt-dix or 4 twenties and ten) centimes / cents. Apparently the lady reduced the price on all items to 20 centimes / cents each. So Sandy got some very good buys. 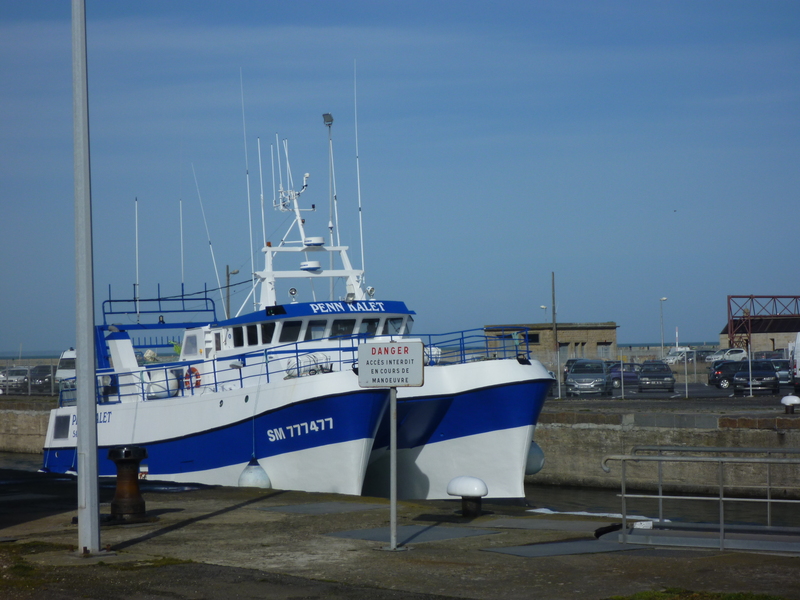 We walked to Saint-Servan to take the bus back and decided it was such a nice sunny day, around 50 F or 10 C, that we’d walk back. On the way, we stopped in at the Au Panier d’Italie (In the basket of Italy) an Italian take way shop. We purchased lasagna, bolognese sauce, and vegetable gratin to enjoy for dinner. open. We watched 5 ships come into the basin and two more went into the lock / ecluse to enter the harbor. 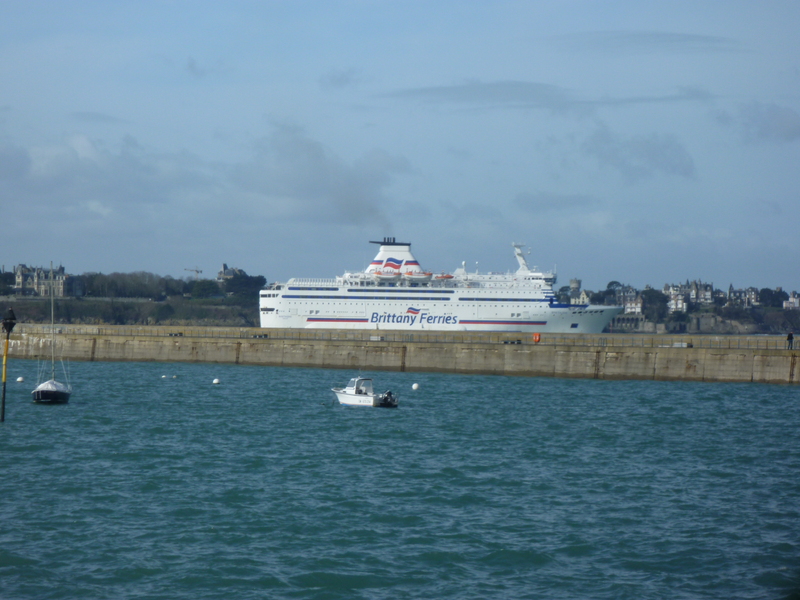 As we got closer to the Port Dinan to enter the Intra-Muros, we saw that the Brittany Ferry was pulling away from it’s dock. 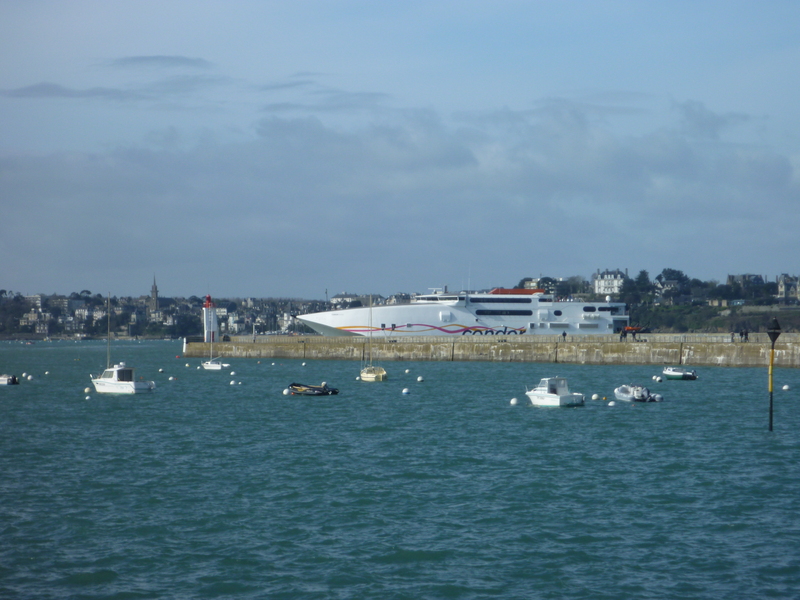 As the Brittany Ferry was leaving the dock, the Condor Ferry was arriving at the dock. Mornings are usually more interesting in the harbor! The Italian food from the Au Panier d’Italie made a wonderful dinner.